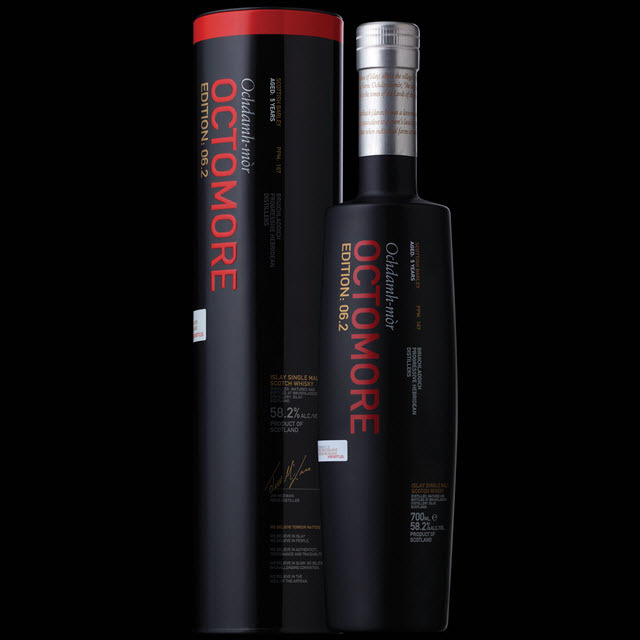 A few months back, Bruichladdich released yet another Octomore; their über-peated, young monsters. The whiskies in this series are usually a lot of fun, in my mind. The new expression is called Bruichladdich Octomore 06.2 Scottish barley. It is again peated at the insane level of 167 ppm phenols. Be warned though, that you should not really read too much into these phenol levels. The liquid you end up with in your bottle is far below 167 ppm. So do not be afraid of these 'monsters', seek them out and have a go yourself. It's sort of like a thrill ride. The whisky is very young, just 5 years old. All previous Octomores have been the same young age, except for one 10 YO expression (see review). Like a few other recent expressions from Bruichladdich, this whisky is made purely from Scottish barley. It is a limited (?) edition of 18 000 bottles, and released exclusively through Travel Retail. I personally think it is a pity that they have chosen to only release this through Travel Retail, as it makes it a lot harder to get. Nose (23/25): Rich, almost thick on the nose. It hits you with wave after wave of peat, but there is also a lot of comforting and pleasing sweetness here, that really takes the edge off the peat. Ashes, vanilla, fruits, malt, ashes again, a bit more fruit, another helping of malt, yet more ashes...did I mention ashes?...peat, smoke, ashes, ashes...yet I must admit I like it. Taste (23/25): Smooth mouth feel, no roughness at all. Rich, peaty, ashy, meaty, creamy and fruity. Finish (22/25): More sweetness on the finish, deeper notes, at the same time it gets drier. Medium long and warm as a furnace. Balance (23/25): I must say I really love this series of whiskies. They are quite different from any other whisky, but they are fun. A lot of fun!